Shopping is always better with beer. The Pitch’s Crafts & Drafts — a mash-up of local artists, crafters, and beers — is Saturday from 11 a.m. to 6 p.m. at the Uptown Shoppes (3600 Broadway). 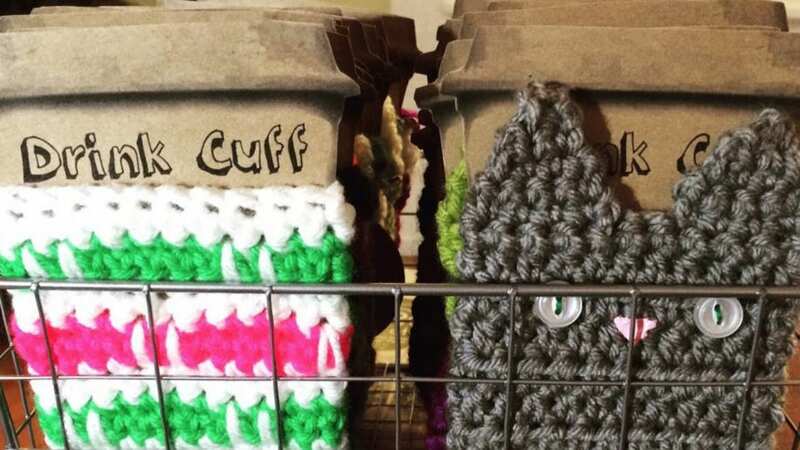 Check out DarkHumorGirl’s knit drink koozies (pictured above, some are in the shape of kitties) and 928 Woodworks’ nail head bottle openers while picking from a list of more than 20 brews. The event is free, you just pay for what you want to bring home — either in your belly or a shopping bag. 75th Street Brewery (520 W 75th Street) is holding a Firkin Friday that kicks off this afternoon. They’ll be adding lemon peel and star anise to their Possum Trot Brown. That beer will appear on the menu at 4 p.m.
Good Friday marks the end of Lenten offerings at Joe’s Kansas City. So, this is your last shot this year to grab a soft shell crab po’boy — a deep-fried soft shell crab with tomato jam, shredded cabbage, and BBQ remoulade, on a hoagie bun. Cuba is top of the mind right now, so why not dive into Cuban cocktails and salsa dancing? Thou Mayest (419 E 18th Street) and Cubanos por Kansas City are hosting a Cuban-themed get together on Saturday at 3 p.m.
It’s always tailgaiting season. The Zoo Home Opener Tailgate for Sporting Kansas City’s Saturday contest with the Portland Timbers kicks off at 4:30 p.m. Swope Park Rangers, one of SKC’s supporters groups, is hosting the tailgate in Lot F. They’ll be accepting donations of canned goods for Harvesters for $1 off your tailgate plate. Want to learn more about wine? Make an afternoon of it at Uncorked: KC Wine Festival at Union Station on Saturday. There’s an afternoon session (1 to 4 p.m.) with more than 50 wineries [the evening session is sold out] and food trucks onsite (Bochi, Jazzy B’s and Fine Thyme among them). Tickets are $53.74. Cocktail attire is requested. — Jonathan Bender writes about food trends and is the founder of The Recommended Daily. Follow him on Twitter @jonathanbender.